i haven't been here lately but i see there are new ways to use google, etc. to make short blog entries. 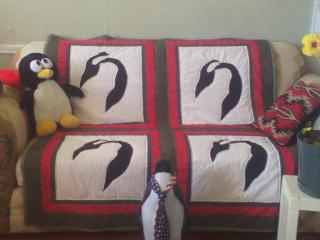 so i'm using a story on some hard times for the little blue and a burst of energy helped by a wonderful penquin quilt from a special friend to slow down my facebook dependence and make something i can be permanently proud of. this is tentatively entitled: capitol hill - where elegant penguins live.